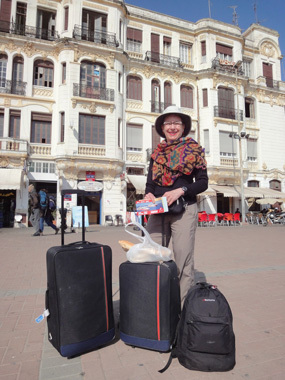 Our long Semana Santa (Easter holiday) layover in Rabat, Morocco created a welcome interlude between traveling through the northern half of Morocco by bus and train and launching our cyclotouring season from Seville, Spain. By the time we were in Rabat we'd fully recovered from jet lag and we were relieved to have the opportunity to then recover from the culture shock of our third visit to North Africa. 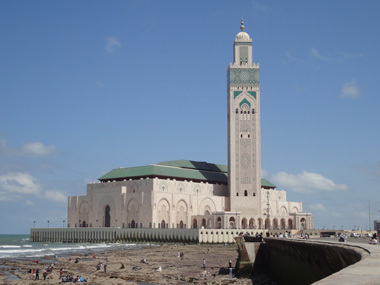 King Hassan II Mosque on a day trip to Casablanca from Rabat. Each year we make a point to travel somewhere that pushes us beyond our comfort, to be in a place that challenges us in ways that accelerate our growth and learning. Morocco accomplished those goals and it was especially helpful to have some downtime while still in the country to integrate the experiences and then begin reorienting ourselves for bike travel. Our travels in Morocco once again confirmed that non-bike travel is much more stressful for us than cyclotouring. This "normal" travel by bus and train usually has a faster tempo; the changes in environment are more abrupt; and we don't have the built-in tension release that exertion on a bike guarantees. And trip planning is always more demanding too as these non-biking side trips usually have a fixed start and stop date, making it more efficient to have a circuit planned before departure. Our trip to Morocco had an intense planning phase before we left the States and then I held my breathe for the first 10 days hoping it would work out. In contrast, Bill usually has the roughest of trajectory for our cyclotouring route that he gradually fills in, with the details only being established a few days or a week in advance. Our sense of being committed to a plan is always much greater on these 3 to 4 week excursions than is the case for most of our cycling year. We were more than ready to shed the stresses of being guests in a developing nation for life in more civilized Spain, a fact that was underscored by sleeping almost 10 hours our first night back in Seville. At last, a bed that didn't feel like it was replicating a traditional straw-stuffed mattress; a dry room that didn't irritate my nose with resident molds and mildews on the walls; and a general ambiance that echoed a favorite phase among the Germans: "All is in order." Finally we could relax deeply, we could sleep soundly. 2 more hours & the head scarf would be put away. But even before we checked into our Seville hotel, I was missing the Moroccan street vendor's carts loaded with plump oranges. The neatly packaged strawberries in the Seville supermarket were 4 times the price and not as good looking as the ones we'd sought-out in the medinas each day in Morocco. And I knew before we left Morocco that I'd never again see their pasty black soap made from olive pressing residue was just what my face needed for a good cleaning. As overwhelming as the medinas were at times, by the time we left Morocco, I knew I'd miss them too. Like any excellent entertainment, a dip into a medina was a low-effort way to abruptly shift our focus, to flood our minds with sensory exhilaration, to delve into a totally foreign reality--they were wonderfully stimulating in small doses. The sensory pleasures of Morocco were instantly gone but what would stay with us was having put Morocco on our personal maps. No longer would Marrakech, Casablanca, and Tangier be the names of far-away places--now they were places I'd been, places I'd experienced deeply. Whenever Morocco makes the news in the future, my being will jerk a little bit and my brain will latch-on to what's being said. For the rest of our lives we'll be wired for hearing how the evolution of Morocco's political process progresses; if the king will be able to relinquish more power; and if the rush towards tourism will indeed spur enough economic growth to address the severe poverty issues before there is an explosion caused by prosperity inequities. We'll be watching to see if the number of North African men risking their lives as illegal immigrants arriving in France by boat decreases; if the government shrinks the world's largest area devoted to cannabis production--a crop that probably is the largest source of foreign currency of the country; and what if anything triggers a resolution to Morocco's several border disputes. Like other 'too-far-away' places such as Croatia, Turkey, and Iceland, the events within Morocco will now forever be of interest to me. One of our picnic spots in Seville's long park. Never mind it was our 4th pass through in Seville, it was like we'd never been there before. The combination of coming from the harsher realities of Morocco instead of elsewhere in Europe or Spain, and being there for the first time in lovely weather, made all the difference. 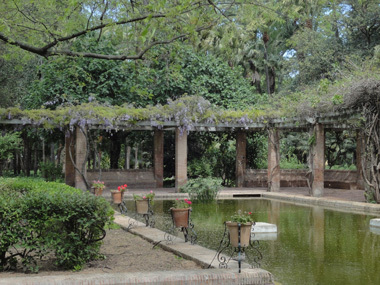 The less than idyllic parks of Morocco made the huge, elegant parks at the south end of Seville irresistible. 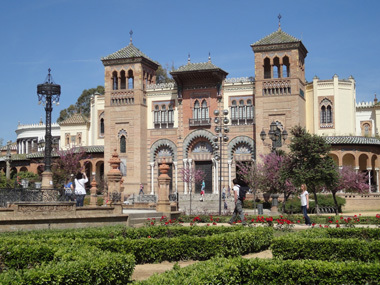 They went unnoticed on our bus ride out of Seville to the international sea port of Algeciras a month earlier but on our return trip into the city after leaving Morocco earlier in the day, the sight of the lush, groomed parks from the bus was riveting. The next morning (after our 10 hour sleep) we fetched our bikes from their 4 months of slumber in a storage locker and headed for the expansive parks and the network of bike lanes enveloping them. And the day after that we visited the parks again on foot. The sunny warm weather; the well-kept, mature botanical gardens; and the social ease of the people around us made it feel like we'd been fast-tracked to paradise. A building from the 1929 Ibero-American Exhibition. Talk instantly turned to extending our stay in Seville but we just as rapidly realized that our minds were caught-up in the fantasy that the delight would extend forever. But the reality was that the weather would shift, either to rains or to being unpleasantly hot, and the spell would be broken. The delight of discovering the stunning architecture within the park from the 1929 Ibero-American Exhibition would soon fade and all of the corners of the long narrow park would quickly become familiar. These had been magical moments and were best respected as such rather than tricking ourselves into thinking the moments could span eternity. Just like the magic in the Italian Dolomites only lasts for weeks each year, so too would this perfect experience of Seville be transient, so we would leave for Portugal as scheduled. Let the Touring Season Begin! 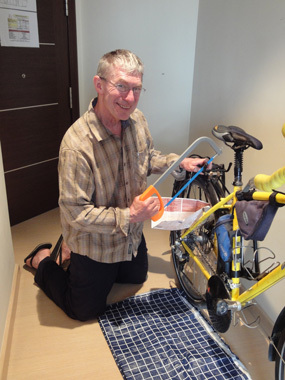 Finally, on Sunday April 11, we launched our bikes to begin Year #10 cyclotouring abroad. As always, we were a little tippy the first minutes on our over-loaded bikes after being off of them about 4 months. But each year the transition to riding again is a little snappier and this year was no exception. A part of me was sure I was going to dump-over when making the first dozen tight turns on the narrow Seville bike paths but my years of riding experience prevailed over the months of disuse of those skills. And it wasn't long until my focus shifted from the mechanics of operating my bike in a crowd to enjoying the process of being on the road again. Taking time for some over-due modifications. The start of our riding season couldn't have gone better. Bill planned short riding days for the first 2 days, which were both about 20 miles with 1000' elevation gain. There was more climbing than expected, but 1000' gain was welcome as a moderate introduction to reconditioning. We spent the entire day on the road the first day, with the extra hours being absorbed by unexpectedly stopping to visit a 14th century monastery; walking the ruins of the Roman city "Italica"; and answering the many questions asked by 2 adult generations of a Spanish family. Papa was a cyclist and was in total disbelief while looking at our bikes and gear and relied upon his daughter to translate his many questions. 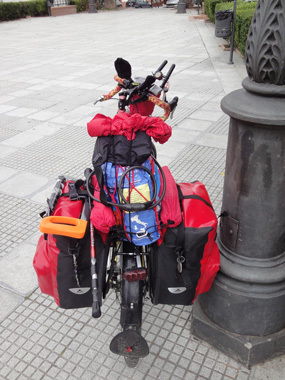 She and her husband were fluent in English and wanted to talk about travel destinations more than the bikes. We can travel for weeks without having extended conversations with others, so socializing so long on Day 1 was a pleasure. Our second day had fewer distractions on the road than the day before but were treated to the privilege of keeping our bikes in our spacious hotel room for the night. That was too sweet an opportunity to underutilize and we intermingled our daily chores of food preparation, laundry, bathing, and computer time with installing the last of the bike parts Bill brought from home. One of our goals for 2010 is to carry less stuff and part of the plan is to carry short term items for less time. So rather than postpone the installation of my shifter cables, brake cables, and handlebar wrap, they moved from Bill's stash to being in use on my bike at the end of our second day on the road. That day we also purchased, used, and left behind a $4 hacksaw needed for a couple of more serious modifications. First time for carrying a hacksaw with us. Our third day out of Seville saw our mileage being pushed up to a little over 30 miles with a proportionate increase in the gain, which was as much as we wanted to do. I cracked a joke when we crossed the Rio Tinto river on the way into Huelva, our destination for the night, as the arrest in China of 4 Rio Tinto employees for bribery had the company in the news for the better part of the last year. It was only later that evening that we learned it wasn't a coincidence but that the Rio Tinto company had been formed upon the purchase of the nearby mines in 1873 and had taken the river's name for their new company. Lucky for us that Bill spotted the mine's sightseeing venue in the guide book that night and he decided we should make the visit by bus rather than detouring for 4 extra days by bike to take it in. Our bodies got a welcome day off without having to make excuses and we had another bonus activity for our brains in visiting the Rio Tinto mines. Part of the Rio Tinto museum was cordoned-off and actually visiting the mines required having your own car, so ours was a disappointingly truncated visit, but we were pleased nonetheless. Nothing captivates me like seeing evidence of Phoenician sea traders that were active almost 3,000 years ago and ogling Roman technology that is 2,000 years old. In addition to finds from these familiar players, there is evidence that the mines were worked as early as 5,000 years ago. We wished we could have taken in all of the available sights at the mine, but seeing what we did see was a bonus. The southwestern corner Spain was unexpectedly pleasant cycling compared with the more eastern reaches in which we'd traveled in the past. A lot of Spain is b-o-r-i-n-g on a bike: not much variation in the dried-out landscape for miles and miles and the tourist sights are few and far between, but not so west of Seville. We guessed it was the wet marine air on the Atlantic side, versus the Mediterranean influence, that made the visual experience so different. The rolling hills were heavily cultivated with stripes of green or freshly plowed fields; olive groves; vineyards; pine forests; and plastic sheeting hot houses sheltering strawberries on the vine. Cork and Holm oak trees were intermingled with eucalyptus and pines; wild roses sported white blossoms, while the occasional red poppies, yellow flowering Scotch broom, and a hardy purple flowering plant added more color. Cactuses added even more depth to the array of plant material in view from the saddle. We carefully avoided the new bypasses and took each of the old roads through the center of the villages, often spending a few minutes on a plaza bench to take in the local scene. Cars, pedestrians, giant John Deere tractors, horseback riders, and horse-drawn wagons competed for space on the mostly single-lane, cobble-stone streets. Decorative tile work adorned the individual facades of the continuous string of white stucco buildings, with the iron-work on tiny second-storey balconies adding to the visual chaos as we sighted our path down the narrow, bustling streets. Hundreds of storks were in residence in their high nests in and around the towns, many on purpose-built platforms atop transmission towers and church domes. Snowy white egrets were also on the list of things to watch for--things that we'd never see on an average day back home. 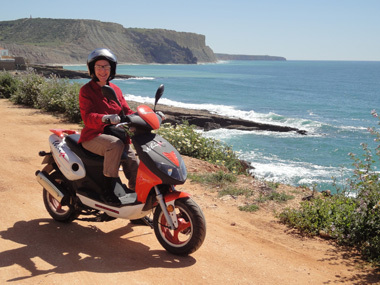 Good weather, the persistent smell of orange blossoms, and lovely hotel rooms that put comparably priced rooms in Morocco to shame enhanced our experience of southwestern Spain as we followed the road signs west to Portugal. Darn it anyway, even with all the traveling we've done, we still forget to pull out the camera when things get really exciting. During this most recent instance of photo-documentation neglect, we were waiting out a fierce wind/rain/thunder/lightning storm that included hail chunks up to an inch long when Bill looked up to see a tornado heading our way. His first conclusion was that it was smoke, but of course the torrents of rain at that moment made smoke unlikely and he thought to take a second look. While he searched for a suitable ditch or other low spot in which to huddle, I strapped on my fanny pack with all of my information essentials and then looked up the word for "tornado" in Spanish so as to inform, and hopefully collaborate with, some nearby warehouse men (I wasn't keen on lying in a ditch during a rain storm.) Neither of us thought about pulling out the camera even though the tornado wasn't approaching all that fast. Luckily for us, the tornado (also "tornado" in Spanish and Italian with a soft "a") veered off before it reached us and we didn't even feel an uptick in the already significant wind. In hindsight it was shocking to realize that had we been on our bikes instead of sheltering from the storm, we wouldn't have even seen the tornado as we were going in the same direction as it was. It was a good reminder to not discount the unlikely when something odd appears in our tiny rear view mirrors when riding. Though it didn't count as a real close call, we both found ourselves nervously revisiting the experience the rest of the day and into the evening--dwarfing the fact that we'd also crossed the border into Portugal that day. It was ironic to be dodging terrible storms the day we arrived in Portugal because for years we'd been in awe as to how the big Atlantic storms hitting Europe often missed most of Portugal altogether. Over and over again we'd watched satellite depictions of this odd meteorological phenomena and concluded that Portugal would be a good place to be when in was cold and wet in the rest of Europe. But the tables were turned on us as a stagnant low pressure system produced a series of storms that flooded Portugal and Spain while the countries eastwards were enjoying sunny, dry weather. We still had to consider ourselves lucky however as this was the same weekend that much of Europe was thrown into chaos with Iceland's volcanic ash cloud grounding thousands of planes--chaos that had no effect on us. That night our fierce weather and the distant ash cloud had us clicking away in our electronic dictionaries: we were rapidly expanded our Spanish vocabularies as it was the Spanish and not the Portuguese TV station that had enough written text for us to roughly follow the details of both events on the evening news. The words used to describe the distant ash cloud and the distribution of the nearby lightning strikes, as well as those words anchoring the events like "at daybreak" and the disruption the flights of dignitaries to the funeral in Poland, kept us busy translating and the day's experiences alive in us. Our first impressions of Portugal itself were overshadowed by the intermittent dark clouds which repeatedly caused white-out conditions with the blowing rain on our arrival day. But as we looked around at the people seated next to us in the little boat shuttling us all across the river which formed the border between Portugal and Spain, they clearly had a different look. The smaller stature and long faces spoke of a chronically poorer country than neighboring Spain. Bill's first words upon returning from a protracted hunt for lodging at the port town of Vila Real Santo Antonio while I sat out of the rain with the bikes was how unintelligible the Portuguese language was. I was in disbelief. I'd fretted a bit about having to deal with yet another new language this year but had been encouraged in the preceding days by my habit of reading package labels. With each successive multilingual product label read while in Spain, I had become more confident that we'd do just fine with Portuguese. Spanish was an excellent starting point for reading the language and Italian was a good back-up when our Spanish vocabulary was too weak. But the unexpected monkey wrench in the works was the pronunciation. When I listened to the B&B clerk and then a man on the phone, I was as dumbfounded as Bill had been. I could listen to sentence after sentence and not recognize a single word beyond "Si" for "Yes" (even "no" wasn't recognizable). My best guess was that they were all speaking a Slavic language, which was a baffling conclusion. An elderly, multi-lingual German woman we ate breakfast with the next morning was sympathetic with our shock and concurred with our disbelief even though she'd been to Portugal many times. And looking at the signs the first afternoon in the country, we finally realized the Portuguese had done what I considered the unforgiveable for a western language: they'd messed with the common pattern for naming the days of the week. Saturday and Sunday were guessable to Spanish and Italian speakers, and perhaps even the French, but Monday through Friday were named the "second fair" through the "sixth fair" (according to our skimpy dictionary). It wasn't that it was so hard to remember the pattern but this spin on something so basic further eroded our confidence in managing with the language. Disappointingly, even in this border town not all of the clerks spoke Spanish so, like when in Slavic countries, we knew we'd be heavily relying on pen and paper to communicate when pointing at objects didn't suffice. 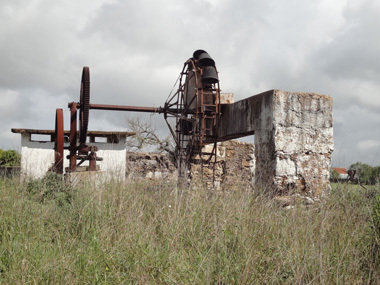 Bucket waterwheels: not such an ancient technology in Portugal. Our other surprise was that one didn't need prior knowledge to know that there was a budget airline airport nearby as chilled Northern Europeans were outnumbering the local population, even in the off season. We of course had to count ourselves among them in doing the outnumbering though we arrived by a different mode. I always find it disturbing when tourism takes over a smaller community--a reaction that makes me want to leave immediately to help rectify the wrong. It feels like we are robbing the locals of their town when tourism leaves such a big footprint even if it is a welcome boost to their prosperity. Our questions about Portugal began before we arrived and grew in number faster than we could collect answers once there. We pooled our collective knowledge about Portugal, which wasn't much, attempting to understand the visibly lower standard of living. Obviously it was a small, geographically isolated country, which tends to hinder prosperity in the modern age. Bill started recalling the names of early Portuguese mariners in its glory days in an attempt to rough-out a time line while my most captivating tidbit was learned early in our travels when the EU was preparing to introduce the Euro currency. At that time we heard a news story as to how Portuguese countryside priests were recruited to teach decimals to their flocks as many Portuguese lacked that skill which would become essential for daily chores such as going to the market. To me that spoke volumes about the lifestyle of many at the close of the 20th century though it didn't explain "Why?". Some things change slowly in Portugal. A bit of reading in our electronic encyclopedia suggested that Portugal's story was that of "riches to rags". At the height of Portugal's colonial era, which began in the mid 1400's, it was the richest country in the world. Not "one of the richest" but "the richest." At its peak, it had colonies in Africa, South America, and Asia. Presumably the governing powers were planning on an unchanging relationship to their colonies and neglected to use some of their considerable wealth to develop a domestic industrial infrastructure. Portugal's wealth was dependent upon the inflow from its colonies and as they went away and the markets changed, so did its wealth, resulting in it becoming one of the poorest countries in western Europe. In addition to lacking an aggressive domestic development strategy, the country's land-tenure system of farming persisted into the 1970's, resulting in little mechanization or modernization of the the agriculture industry. Portugal doesn't have a lot of prime agriculture land to begin with and poor utilization of what they had was a formula for poverty. That was as much "Why" as we could generate in our first couple days in the country. We were cringing and recoiling our first couple of days in Portugal and kept asking ourselves: "Why does absolutely everyone we've known for the last 30 years who has been to Portugal love it?" when we don't. The stormy weather didn't help but it was the combination of the low standard of living and the heavy-handed tourism overlay that repulsed us. It was too weird when we walked from our arrival town to the next one between downpours and found rows and rows of 4 star hotels choking the town when a half-dozen 30-something locals were sheltering under the supermarket awning to sell tiny snails by the scoop in our town a couple of miles away. The disparity between the have's and have not's was too great, the infrastructure created just for the tourists was too dominant, for us to feel comfortable. I quickly decided it was fortuitous that we were visiting Portugal after a month in Morocco, a month in which we had been immersed in a country with a low standard of living. Juxtaposing Portugal with Morocco instead of Spain suddenly looked like a better way to frame our experience and yet I wasn't looking forward to another 2 months of the meager existences of the masses filling my visual screen. 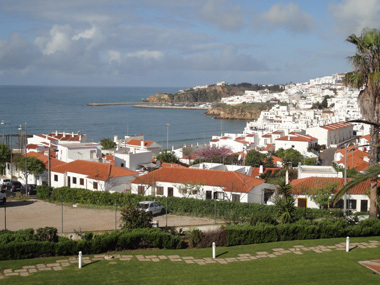 But by the time we stopped for lunch the next day at Olhão we sensed a better balance between the tourist and local culture, which allowed us to linger on the town's green promenade strip for our picnic and not feel ashamed of assaulting the community with our presence. There was a more familiar range of lifestyles of the local people in evidence, which eased our angst. What a view from our Albufeira apartment. Our distressing first impressions of Portugal further softened that afternoon when we arrived in Faro as it was clearly a city of enough substance to absorb the tourism press without being diminished by it. An exhibit in their tiny museum stated that an Italian doctor living in Faro had been so sought-after for his remedy for syphilis in the 19th century that 6 hotels were built in response to the influx of visitors, so they clearly had a long history of coexisting with tourists. But it was the following day when we arrived in Albufeira for the night where we succumbed, it was here that we said "This is why people come to Portugal." We had landed a large, quiet, 1 bedroom apartment with a lovely sea view and big balcony for 38€/night or a little over $50. It was huge, flooded with natural light, fully equipped, and tranquil. We immediately plopped down on the couch to listen to the CNN update on the Icelandic volcano/airline crisis with one ear and looked out at the lovely view of the rocky coast line and the sea. Warm breezes blew in through our wall of windows and sliding glass doors and we contemplated how many nights we could stay there without moving a muscle. Whatever was left of the fishing village before Albufeira began morphing into a package tourism destination in the 1960's didn't show. But once we stepped into our apartment, the sandwich boards in English advertizing the day's special and the hundreds of little shops catering only to beach and booze-bound tourists were out of sight. The terraced buildings between us and the sea didn't detract from the pleasure of our view and for all we knew, we were in a little Portuguese fishing village on a lovely spring day. As ardent historical museum goers, we will give almost any museum of antiquity or old technology a go, and that willingness gave us an interesting experience of Portugal. 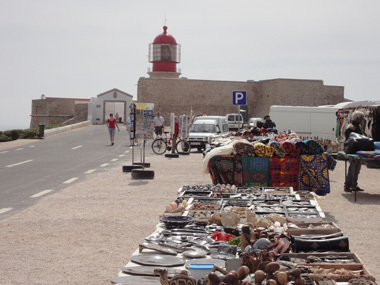 The museums we visited in the Algarve (the southern coast) were universally small, often with only a handful of finds, but they were consistently the liveliest exhibits of any we'd seen. The small Roman exhibit in Faro's museum had a discussion of daily life which ended with "And they loved!" Hardly the clinical vocabulary of most exhibits we read. My favorite of Portimão's fine dioramas: building an ancient tomb. With each museum we were seeing a consistent pattern of the narrative stepping into the middle of the exhibit instead of observing it from the outside. We marveled at how many times we were saying "Ah, so that's how it was...." because the exhibit filled in little missing details, like showing operating a hand mill on a woven mat. "Of course, the quern should be on a mat to catch the grain that falls" was our thought. 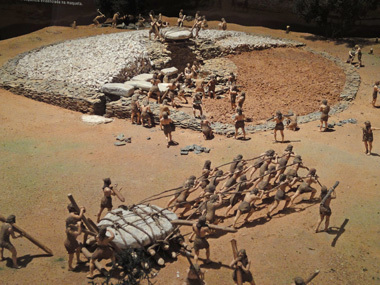 Or the diorama in Portimão that shown the pre-Roman technic of 'cutting' massive stones in half by hydrating wooden wedges into an initial cut to let the expansion of the wood crack the stone in two. We'd read multiple exhibits about the technic but in this museum they showed a row of wedges the length of a huge rock with a couple of people working on it. We came to treasure the chance to drop in on a Portuguese museum just to see what familiar concept would be illuminated in a new way for us. Their attention to detail on explaining some processes made it easy for us to overlook their repeated sloppiness in presenting the details of evolution, depictions where they often showed our ancestors walking upright 25 or 40 million years ago when the generally accepted date is around 3.5 million years ago. Like everywhere, there were the disappointments however. The cork factory museum that we made a special inland detour to see had mysteriously closed about 2 weeks prior to our arrival. "Bad management" was the closest explanation I got from the woman at the archeology museum and no one had a clue as to when or if it would ever reopen. And then there was the tholos or ancient burial tomb that was closed for the season for 1 more week. They became the first entries on our "Next Time" list for Portugal. Bill's transaction for a room for our first night in the country ended with him reporting both that the language was impossible to understand and that the people seemed to have a very protracted conversational style and both of those observations gained data points as we traveled west along the coast. We continued to be baffled by the Slavic sound of the Portuguese language and our ability to understand or speak it made little progress after 2 weeks: "Good day", "Thank you", and a few numbers was it. Just as shocking was our continued relative ease in making rudimentary translations of the written word. Our first afternoon in the country Bill was able to muddle through the written Portuguese instructions well enough to connect our laptop to the internet via a cell phone service's instruction kit. Even a road sign warning that the edge of road was in bad condition seemed clear from our knowledge of Spanish and Italian. Occasionally we'd read something that was totally unintelligible, but most of what was important to us on signs and packages was decipherable without consulting our dictionary. However I wondered if dementia was setting in after I listened to a Portuguese woman speaking solid English describe the 2 room options available to me and I was still totally confused. There were 2 sizes of rooms and 1 size of room had 2 layout options plus a regular and a discounted price. It was unimaginable to me why it had required about a 10 minute dialogue with the hotel clerk for me to be clear about the combination of choices when I was able to summarize it to Bill in a single sentence. I finally decided it wasn't dementia in me but the non-linear presentation style of the clerk. After several more head-spinning exchanges, we concluded that our linear brains were being muddled by more of a meandering, spiraling, conversational style of some Portuguese. And we were amazed by how long conversations between 2 Portuguese could take when it appeared that the transaction was straightforward, like in renting a room, which added more weight to our conclusion that it was a cultural conversational style having nothing to do with us. We reminded ourselves to be patient and to anticipate the need to shake-off a load of confusion after some conversations. The Portuguese struck us as a generally very nice, kind group of people. We'd got cute little smiles out of middle-aged museum staffers who stopped to tell us a tidbit about an exhibit and a non-English speaking pharmacy clerk made a small performance out of presenting me with 2 tubes of sunscreen that she fetched from the back room. And when I unceremoniously dumped over on cobbles, a man in the nearby pool hall came to my rescue before Bill could drop his bike. Cue stick in hand, the man started to help me up when I pointed to my upper foot still clipped to the pedal. In a flash he'd released the 3 Velcro sandal straps; had my foot out of the sandal; and my sandal released from the pedal before I could mumble much of anything. He and Bill lifted my loaded bike off of me; he smiled when I made it to standing; and just a fast, disappeared back into the bar. One in a series of park benches in Portimão. Colorful ceramics and tile work are common in the Mediterranean countries but Portugal was distinctive for the propensity to tell a story rather than just be decorative with theirs. We visited a small church west of Faro in which the entire interior walls and ceiling were covered with blue and white tiles depicting the life of saint (no photos allowed). 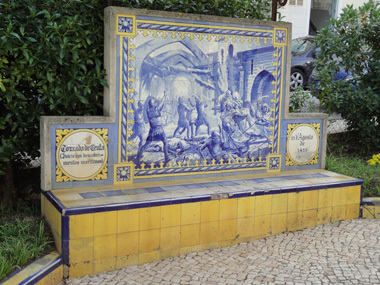 In Portimão a series of park benches were covered with tiles, each telling the story of an important moment in Portuguese history. And home front doors were often protected by a religious depiction on painted tiles. The North African Muslim's conquest and occupation of Portugal spanned roughly the 8th through 13th centuries and isn't just acknowledged in their museums as in countries like Spain, but is celebrated in the museums. Like with other exhibits in Portugal, the tone wasn't a detached "This is the path our country traveled" but "This is who we are, isn't this cool?!" As hoped, Map Man found us the perfect place to practice our new skills developed back home last winter in our motorcycle-license-endorsement classes. Dumbfounded that we had the stamp of approval on our licenses without ever leaving the parking lot, we longed to log some experience in traffic. 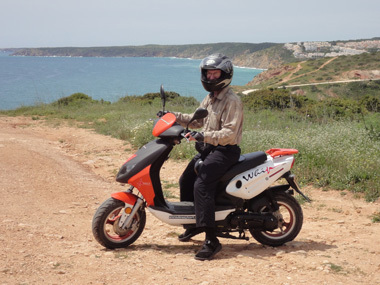 Renting motorcycles at home was prohibitively expensive, so Bill targeted the beach resort towns of southern Portugal as a likely place to more easily hone our skills, and it worked. Pausing out of traffic during our first big scooter outing. For a fraction of the price back in the States, we were able to rent 2 scooters for 24 hours at the resort city of Lagos. The 50cc scooters were so underpowered that we knew we couldn't get into too much trouble and, unlike motorcycles, had automatic transmissions. We were delighted to set aside the stress of shifting gears while we had our first immersion with moto-ing in traffic. Unlike back home, many locals and tourists flit around by scooters and motorcycles, so the area drivers were quite accustomed to sharing the road with all of us. They patiently waited when the slow speed delivered by our little motors caused us to obstruct traffic on narrow, one lane village streets and whizzed by us as we took our proper place in the shoulder on the open roads. Never quite knowing where we were going during our first afternoon outing in Lagos, we instantly became experienced with riding on rough cobbles up and down very steep, very narrow lanes and in navigating the always-stressful traffic circles. The next day when we took to the coastal back roads, we hit parts of through roads that were rutted dirt with large stones and mud puddles. We went down a road so steep we wondered if we'd have to push our way back up but we pleased the loud little engines could claw their way to the top. Bill loved the premonition of power and the noise of the engine while I delighted in the excellent aging-brain challenges of integrating new coordination skills in a rapidly changing environment. Great fun but I'm a cyclist at heart. Unexpectedly, the hardest aspect of riding these puny scooters was getting them started again when on other than smooth asphalt. Bill said it was the small tires as much as anything that made them balk at powering their way out of a rut in the dried mud or an awkwardly placed embedded rock. We'd often plant both feet on the ground and give a good push to get underway or back-up so as to find a smoother track. In our 24 hour rental period we logged about 4 hours of riding time though rarely made it over 20 mph. We reveled in the chance to be on the road and in traffic where scooters were commonplace and the level of traffic was low. Our skills in reading road surfaces from our ten's of thousands of miles of cycling were put to good use and we trust that time on the scooters will help keep our car driving skills a little fresher too. We hope to repeat the experience again in northern Portugal on scooters with a bit more power. And now we know too that the noise of these 2-wheelers with engines blunts our experience of the world in a way that cycling does not, which makes it even less likely that we'll ever change camps. 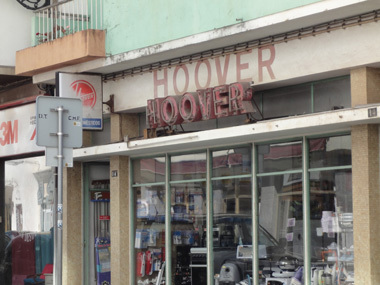 During our pokey east to west traverse of southern-most Portugal, we experienced a curious cultural gradient. It began as we crossed the border from Spain when we were instantly struck by the short-statured local Portuguese people that we saw--people that looked like they'd had a history of disadvantaged living. But immediately those images were oddly juxtaposed with pale, overfed northern Europeans on holiday at 4 and 5 star resort hotels. 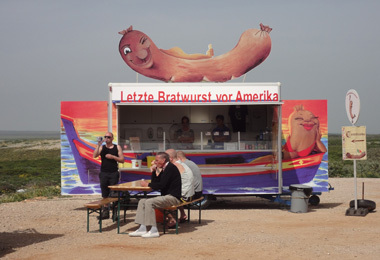 "Last bratwurst before America" at the SW tip of Portugal. As we slowly traveled west, it was the Brit's who were the most clearly evident--northerners whisked en masse far south by budget airlines to dispersal points like Faro. Sandwich boards on the roadsides advertised "Full English Breakfast" and pub specials were written in English. Honeycombs of gleaming white condos crammed onto the hillsides popped into view as we rode west. Studying the faces and affects of motorists had us suspecting that many of these travelers were renting cars once they arrived. A little farther west and the German presence was being felt. More German newspapers were on the stands and beer gardens were promoted. At times, we had to remind ourselves that we were indeed in Portugal. When we were about half way to the western seaboard, the percentage of cars on the road with foreign plates suddenly shot up and increased as we progressed. As usual, the Germans and Dutch were out in the biggest numbers, with occasional small groups of French RV's buzzing along. And the occasional sighting of right-side drive cars with Portuguese license plates suggested the Brit's were in residence for months at a time in this area. But the real shock was when we arrived at Sagres on the southwestern corner of Portugal when suddenly sport and not nationality was the defining issue--and surfing was the sport. Being surrounded by 'surfer dudes' that seemingly came out of nowhere had me feeling like the increasing humidity and winds had somehow slipped me into a time warp. It was all I could do to subdue my snickering as there I was, a graying old lady in funny looking clothes now staring at the beach boys from my teens. How humiliated those cool dudes would be if they knew how silly I thought they looked as the cult attire hadn't changed much in 40-50 years. They acted so cool and yet I realized it was they, not me, caught in the time warp. Just like the clones from the 60's they seemed to come out of a common mould: lanky white young men with sun (or otherwise) bleached, mop-head-like hair in baggy shorts and flip-flops with drowsy expressions on their faces. Around town, they seemed to spend an inordinate amount of time stretching like they'd just gotten out of bed and then rubbing their eyes with their knuckles. The whole scene was weirdly fast-forwarded for me when we noticed how many of them were German-speakers--not the language of the California beach scene that was celebrated in my youth. I stifled my giggles each time the slowly swaggering, half-naked men scratching their bellies appeared on our radar. We began seeing them everywhere--in the markets, in the village squares where we'd seek out shade for our picnic lunch, and in our hotels or hostels for the night. We sharpened our skills at spotting them on the road as they preferred vans and station wagons (no woodie's however), rented or driven from their home land. We briefly spoke with an American duo at our Sagres hotel who had rented a car but no doubt many full-timer's were camping. From the expressions on some of the more alert ones, I'd say that they found our presence in their haven as bizarre as we found happening upon them to be. The historic lighthouse & trinkets near the surfer's heaven. We rode out to the lighthouse perched on the southwestern-most point of Europe and then turned our front wheels due north. We'd traversed the southern coast of Portugal, the Algarve, and would now explore the length of the country south to north. Tourism would be less prominent, the annual rain fall would increase as we progressed, and we braced ourselves for weeks of daily headwinds. We hoped to travel north quickly enough to avoid being baked by the approaching summer weather; we hoped to learn more about Portugal along the way. Our 4-5 day stay in Lisbon was extended a few days because of the Pope's visit to Portugal; then a day because I irritated my knee doing fitness work in the hotel stairwell; and then another week because of a family emergency. We've seen our "A" listed museums and "B" listed museums; walked and visited the 4 corners of Lisbon; made a day trip by train to the "must see" town of Sintra; and rated Lisbon's various green spaces for their picnic attributes. The weather has turned from cool and threatening rain to down right hot. My knee is still a little edgy but we are hoping to be back on the bikes and on our way north in 2 days.